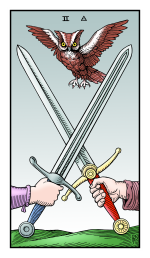 Weekend Reading: Two of Swords from the Alchemical Renewed by Robert Place. This card is about actively questioning and seeking wisdom. It's about not taking things at face value. It's about finding out for yourself. So this weekend, ask questions. Maybe you need to have an internal debate about why you want such-and-such thing. Maybe you're questioning why your kid needs to borrow $50. Or maybe you're asking if something you've being doing for 40 years is truly genuine to you. Whether you're buying $5 cups of coffee or spending 15 minutes every morning warming up your car, ask yourself why. And keep asking why until you get to a REAL answer. We do too many things on a daily basis just because it's the way we've always done it. Or because everyone else does it that way. But if you want to start living more consciously and nourishing yourself more effectively, it's time to start asking some questions.